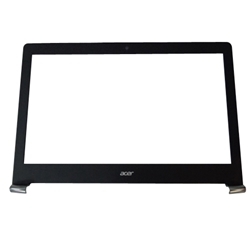 New Acer Aspire V Nitro VN7-792 VN7-792G Laptop Black Lcd Front Bezel 17.3"
Home → Laptop Case Parts → Acer Aspire V Nitro VN7-792 VN7-792G Laptop Lcd Front Bezel 17.3"
Acer Aspire V Nitro VN7-792 VN7-792G Laptop Lcd Front Bezel 17.3"
Description: New Acer laptop lcd front bezel, 17.3". This part is black in color with silver hinge cover caps. This may be the part you need if your existing bezel is cracked or damaged. Compatible Part #'s: 60.G6RN1.004, 460.06A02.0001.